Tommy Cooper was a master magician and comedian. My company is one of the few in the UK that keep in stock the equipment Tommy Cooper used, such as the Multiplying Bottles and the Educated Duck. While people enjoy seeing the tricks done, they are not the highest sellers, and there is an expectation that the tricks by Cooper will be performed in the same way as Cooper did, and that's tricky. The reason I did it like that is that was what sold it, and I still keep that link to my website (and if I ever perform it, it's still in that style). Funnily enough, I bought 3 x Cooper Bottle tricks and 3 x Educated Ducks last Friday in an imported order and put them on eBay with all the other stuff and 2 of the bottle gags and one of the ducks sold over the weekend. So I guess it's a supply and demand thing. "Plus the fact that I do price everything sensibly as I like to turn over my stock." It's easy, and you can carry it around and it's now part of my Mad Magic Workshop, which you can come over to Olney for, or I bring the workshop to you. 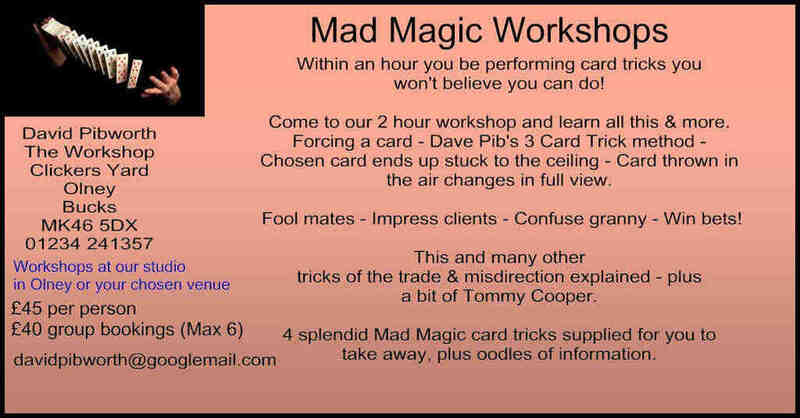 Just take a look at www.mad-magic.co.uk for details. I'm buzzing around in February doing workshops mainly in the Midlands, but also in Exeter for the Pauline Quirke Academy who love the fact that I'm the only outside tutor to turn up and cut my arm off and set things on fire. "Children like that kind of thing, and let's be honest, so do the adults." If you happen to be at the Pancake Race in Olney today (Tuesday 9th Feb) then I shall be one of the MC's on the Market Place. I'm the one with the hat on, making things disappear. Go on, check out my workshops, you'll love 'em.